RED CLIFF, WI – The United States Mint (Mint) joined the National Park Service today to celebrate the release of the America the Beautiful Quarters® Program coin honoring Apostle Islands National Lakeshore in Wisconsin. The coin is the second of five America the Beautiful Quarters coins to be issued in 2018, and the 42nd release in the series. The Apostle Islands National Lakeshore quarter design marks the 100th new reverse (tails) of this coin denomination since 1932. This latest design depicts the sea caves at Devils Island with the lighthouse in the background and a kayaker paddling in the foreground. Inscriptions on the reverse are “APOSTLE ISLANDS,” “WISCONSIN,” “2018,” and “E PLURIBUS UNUM.” The obverse (heads) design depicts the 1932 restored portrait of George Washington by John Flanagan. Inscriptions are “UNITED STATES OF AMERICA,” “LIBERTY,” “IN GOD WE TRUST,” and “QUARTER DOLLAR.” A digital image is available here. “Just as the guiding light beacons from the Devils Island lighthouse-as it has done for decades-the Apostle Islands Quarter will serve as a shining example of the inherent value of Apostle Islands National Lakeshore, and the people who protect it and frequent it…shedding light on its splendor, beauty and purpose, for future generations to follow,” said Marc Landry, Acting Associate Director of the Mint’s Numismatic and Bullion Directorate. More than 500 people, including 200 schoolchildren, gathered in the nearby Legendary Waters Resort for the festivities that included performances by the Bayfield High School Choir, Red Cliff Veterans of Foreign Wars, Wiigwamm Express, Red Cliff Youth Drum Group, and the Washburn High School Jazz Band. Former Bayfield mayor Larry MacDonald served as master of ceremonies. Guest speakers included Rick Peterson, Tribal Chairman of the Red Cliff Band of Lake Superior Chippewa; Mike Wiggins, Tribal Chairman of the Bad River Band of Lake Superior Chippewa; Henry Buffalo, Elder of the Red Cliff Band of Lake Superior Chippewa and descendant of Chief Buffalo; and Bob Krumenaker, Apostle Islands National Lakeshore superintendent. The ceremony, which culminated with a public exchange of $10 rolls of new quarters, included special recognition of United States Mint Artistic Infusion Program designer Richard Masters, creator of the coin’s design. 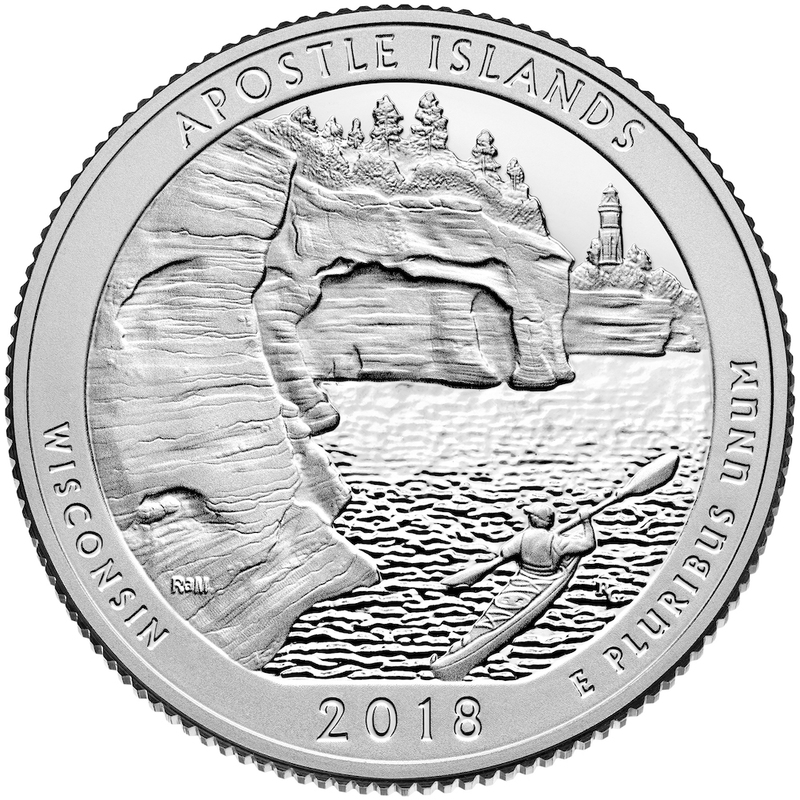 The United States Mint is offering products featuring the Apostle Islands National Lakeshore quarter at its online catalog. Click here for details. Public Law 110-456 authorized the 2009 launch of the America the Beautiful Quarters Program. It is a 12-year initiative that honors 56 national parks and other national sites. Each year until 2020, the public will see five new national sites depicted on the reverses of the America the Beautiful Quarters coins, with a final coin scheduled for release in 2021. The Mint is issuing these quarters according to the date each location was designated a national site.